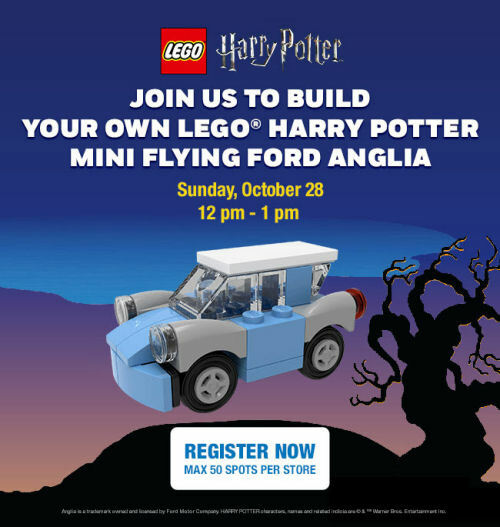 Parents can bring their children in to their local branch of Toys "R" Us to build a mini version of the infamous flying Ford Anglia - the same magical car which was used by Ron, Fred and George to rescue Harry Potter from Privet Drive in Harry Potter and the Chamber of Secrets! The event runs from 11 am to 1 pm and requires pre-registration so click on the image below and find your nearest branch. The event is recommended for kids ages 4 and up, there is no purchase necessary and a limit of one per child will be in effect.